Thank you for your support! 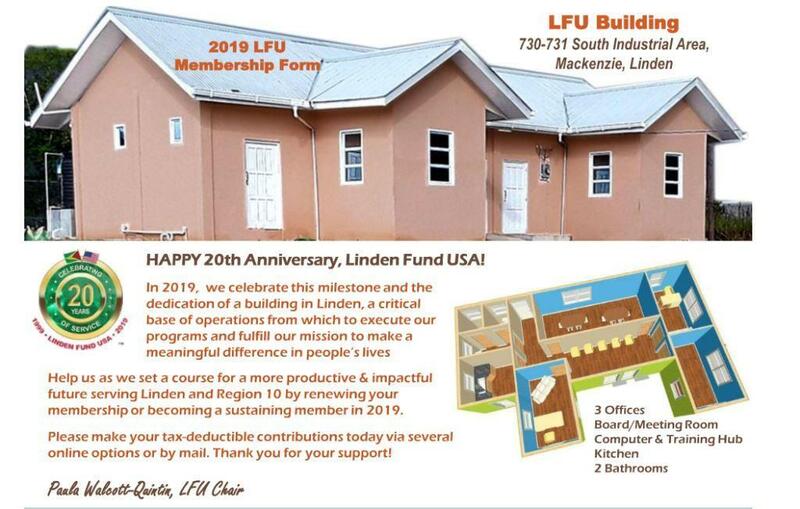 Your contributions to our projects as well as your participation in our events have sustained the Linden Fund USA (LFU) into its 20th year of operation. We ask for your ongoing support as we mark this significant milestone, together. We’ve made it easy for you to give and help us in 2019, via several options on our online portal or the downloadable form, which is also attached. Please become a sustaining LFU member and give generously TODAY! Your contributions and donations are tax-deductible, and a calendar year tax letter is sent to every contributor, no matter the level at which you give. I invite you to share this email with your own network of friends and family so we can build our hometown together. Do keep up with our activities and projects on the LFU website, Facebook page, and YouTube Channel. Linden Fund USA – April 8, 2019. The Linden Fund USA (LFU) is an organization comprised of dedicated volunteers. Our twenty years of service is the result of individuals who have volunteered their talent, their time, and their expertise. Without these individuals, the LFU would not have been able to accomplish all that it has. To members, supporters and collaborators, past and present, thank you for your enduring spirit of volunteerism, which is highly valued and appreciated. Happy Volunteers Week (April 7-13, 2019!